6.30am The morning of the annual Abergavenny Food Festival Conference organised by Miller Research! The Priory Centre had already been set up the night before, so there were only a few minor adjustments to make to the layout and last minute adjustments to the audio visual equipment… and time for a large black coffee! 9.00am The first delegates arrive at the Priory Centre for their registration and coffee. Most of them make use of the complimentary Wi-Fi in the Priory Centre to send Tweets using the hashtag #FoodConf with the live Twitter feed allowing the messages to be displayed on a large screen. It was great to see so many people engaging in social media – even the Tourist Information Centre joined in with a message welcoming delegates to Abergavenny! Those who could not make the conference were able to follow the discussions through Twitter. Sarah Dickens and Nick Miller welcome the delegates and introduce the speakers for the conference while the technical team from West Ent make some minor adjustments to the sound. 11.00am The stone masons move their mobile workshop out of the Priory Centre courtyard and pack up their equipment. As they make their escape for the weekend, the Food Festival team arrive on site to erect stalls – perfect timing! Careful driving is required to negotiate the tight corners, and avoid the neatly trimmed box hedge – the poor driver only passed his test last week! Meanwhile, the Food Festival Conference is well underway in the Priory Centre, oblivious to the activities taking place outside. Speakers include Charlie Hicks, greengrocer extraordinaire, and Kate Bull, co-founder of the Peoples Supermarket. Time to set up the Music Room for the afternoon’s breakout group… and grab another quick coffee! 11.30am The swing boards from Pomegranate have arrived and are assembled in the Tithe Barn – thanks to Natasha for working so hard to create an eye-catching advertisement. The ladies in the Tourist Information Centre are certainly pleased with the result – and I am sure they will enjoy the workout carrying it in and out each day! It obviously does the job well as moments later I receive a Tweet explaining that a foreign couple had seen the sign and wanted to know how to reach us! The Food Festival conference break for their coffee and Welsh cakes – and an opportunity to send a few more Tweets. The Tithe Barn is already busy with visitors – Janet Jones is doing a great job showing them around and talking about the Abergavenny Tapestry. 1.00pm It’s lunch time in the Priory Centre and the delegates tuck in to the True Taste buffet provided by the Tithe Barn caterers. No chance of lunch for me – there’s plenty of tidying up to do around the site as more and more equipment arrives for the weekend – including an endless supply of electrical cable and four industrial size bins! Will someone please take the broken shopping trolley back to Tescos?!? 1.30pm The Church forecourt has been turned into a car park – two white vans and several cars. Why is it that the person in a hurry to leave is always the one stuck in the far corner? After several weeks without one of the interactive computers upstairs in the Tithe Barn exhibition, the technical team from BlackBox AV finally have it up and running! Jules from Black Mountain Gold has arrived to set up his stall for the weekend with a present for me – a delicious slab of chocolate with coffee beans. So, it’s chocolate and coffee for lunch! 1.45pm The delegates at the Food Festival conference will shortly be hitting the streets of Abergavenny to visit a number of shops and stalls in the town – but some of them have never been to Abergavenny and may get lost! Time for Chris, from Miller Research, to borrow Richard’s laptop and print off a few maps. Panic over! Members of the Mothers’ Union and Ladies Fellowship have just arrived in the Church to start the cleaning ready for the weekend’s visitors – they can come to my house when they’re done! Armed with their maps, hot off the press, some of the delegates head into town while others gather in the Music Room for a small workshop. 2.30pm With the vacuuming done, the ladies in the Church turn their attention to their displays – how is food depicted in the Bible? More printing and laminating in the Tithe Barn office / broom cupboard. A delivery man arrives in the Tithe Barn announcing that he has the sausages for this evening’s dinner – which we know nothing about! After a few frantic phone calls, the driver soon realises that he has come to the wrong venue and apologises for and panic he may have caused. Time for a deep breath… and relax! Meanwhile, the Food Festival crew continue assembling the stalls despite the looming black cloud – let’s hope that it soon passes over! 4.30pm With the conference drawing to a close the delegates retire to the Tithe Barn for a glass of wine and canapes and an opportunity to discuss the issues that have arisen during the conference. Thanks to the delegates who very kindly donated to the Tithe Barn Manager’s nominated charity, Dogs for the Disabled – he has promised to climb Pen-y-Fan dressed like a dog if he raise £500 this weekend! Time to clear the Priory Centre and set up for Vin Sullivan‘s fish demonstration. It’s all hands on deck as we move 50 more chairs back downstairs to the Priory Centre and the tables to the Vicarage lawn – thankfully there are a couple of willing choir members and a Churchwarden to help with the task! Sam from the Sugar Loaf Soap Company arrives with another delivery of delicious handmade soap which she will be selling in the Tithe Barn over the weekend – her display is looking and smelling fantastic! 7.30pm Apart from chocolate and coffee, I haven’t eaten all day so it’s time to grab a few chips. Then, back to the Tithe Barn to print and laminate signs for the weekend. 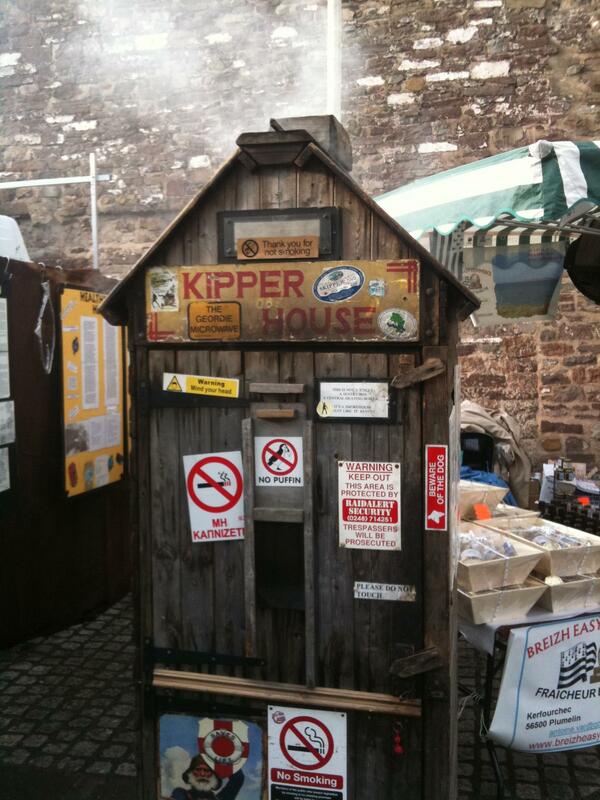 The ‘Kipper Man‘ has decided to sleep in his van for the evening (it’s either that, or his smoke house) so must remember not to make too much noise! Thankfully, the site is securely locked overnight and patrolled my members of the local security company. I hope they don’t get too wet during the night! Tithe Barn manager to climb mountain dressed like a dog! Manager of the Tithe Barn, Richard Morgan, has already scaled new heights by taking part in a sponsored trek in Nepal earlier this year. 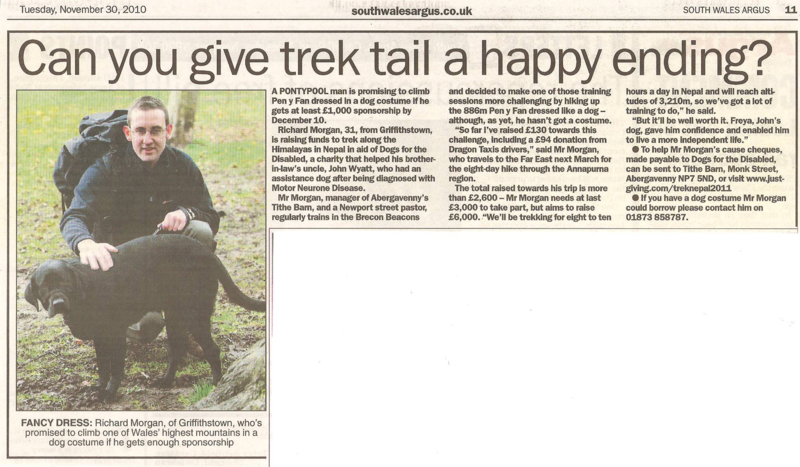 Richard joined a group of 30 trekkers to take part in a 10 day trek in the Annapurna region of the Himalayas and helped raise over £90,000 for the charity, Dogs for the Disabled. Now safely back home in Monmouthshire, Richard hopes to raise even more money for the charity by climbing Pen-y-Fan (886m) dressed like a dog! He is encouraging family and friends to make a small donation via www.justgiving.com/treknepal2011 and if he raises at least £500 by 22nd September, he will climb the mountain in fancy-dress! Richard will, of course, be wearing a pair of Holy Socks to protect his paws! Many dream of escaping to a simple country life, but for those who live in rural Britain it is a different story. Traditional industries are in decline and across the land local pubs, shops and farms – the very cornerstones of country life – are closing at an alarming rate. The rural village of Myddfai, situated near Llandovery in the Brecon Beacons, is just one example of this. The village has a remarkable heritage and many tales of myth and legends. During the thirteenth century, so the records say, Myddfai was much frequented by physicians and a collection of medicinal remedies was compiled. A study of these recipes shows that Welsh medicine was far in advance of most of Europe at that time, with directions given as to the quantities and methods of preparation of the ingredients – most unusual at that time. The medicines recommended were to be carefully prepared and administered to treat all kinds of ailments, most of which were related to the living and working conditions prevailing at the time. Over the years, the story of the Physicians of Myddfai has become bound up with the legend of Llyn y Fan Fach. There are many versions of the tale, more or less elaborate, but common to all of them are the wooing of the Lady of the Lake with bread and the consequences of three ‘blows’ being struck. The young couple reportedly went to live at Esgairllaethdy where they raised three sons who were to become the physicians. Despite this wonderful history, the village itself has no amenities. No school. No shop. No pub. No mobile telephone reception. However, the residents decided to to create a brand that captures the heritage and values of the village and were lucky enough to secure funding from the Big Lottery Fund award to develop this social enterprise. Their aim, ultimately, is to provide a social hub to make the village more accessible and welcoming. The Myddfai Trading Company has created a number of quality products which are being sold to support the pioneering enterprise and help this tiny village become again what it once was – a vibrant, growing community and a fabulous destination. 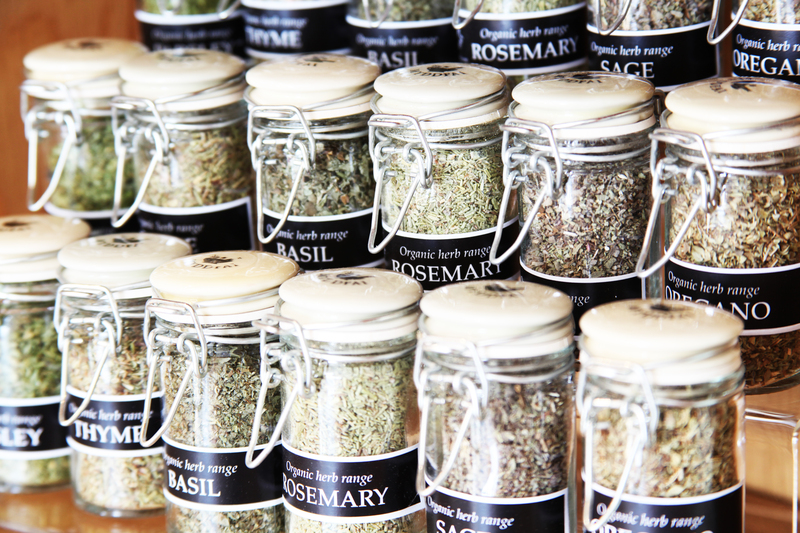 The Tithe Barn is proud to be able to help support this community venture and now stocks a number of these items, including organic herbs, relaxing bath bombs and Welsh herbal teas. Next time you are visiting us at the Tithe Barn, why not help support this enterprise and purchase one of their gifts? The village was featured on the BBC documentary, Village SOS, last night. It is available to watch on iPlayer for a limited amount of time.